As a tragically obsessive consumer of music, I am used to the idea of expectation out-performing reality. It has too often been the case that the act of imagining the tantalising possibilities of an eagerly-anticipated album has provided rather more fun than the experience of actually listening to it. Having learned to live with that kind of disappointment, it was always a particular treat when something managed to match my hopes and expectations. In the mid-80s, I had been a fan of the cult (i.e. chart-avoiding) band Microdisney. The talents of composer Sean O’Hagan and singer /lyricist Cathal Coughlan were finely balanced, with an ever-present tension between their sophisticated music and the somewhat caustic lyrics. O’Hagan’s love of the Beach Boys and Steely Dan was obvious, while Coughlan’s default mode of righteously-vented spleen helped give the songs something of an edge. and he peddles skag in Hamilton. He's the reality man, reality man." 'Bishop of Babel’ was, to all intents and purposes, a power ballad, while ‘13th Century Boy’ represented a jolly, if slightly skewed, take on Stock, Aitken and Waterman’s chart-dominating disco formula; it may have been intended as a pastiche, but it worked pretty well as a pop tune. Say that I'm dead, having swallowed my leg"
Hearing Coughlan on this kind of vocal form, you can’t help but wonder why he didn’t become the voice of his generation; his singing is beautiful, expressive and just dripping with gravitas. In Microdisney, his grouchy misanthropy (at times, outright nihilism) had been ameliorated by O’Hagan’s deft tuneage, but once Cathal got the keys to the car, the listener had to endure an altogether bumpier ride. 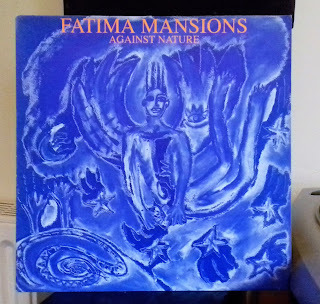 He went on to make more thematically coherent albums with The Fatima Mansions, although there were times when the band’s dreary muscularity bludgeoned the tunes into a bloody pulp and it was frustrating to hear a man with a golden set of pipes opting for the kind of testosterone barking favoured by vocalists with a fraction of his talent. On stage, Coughlan and the Mansions could be electrifying. I remember one gig at Glasgow University when he deliberately whacked himself in the forehead with the microphone and drew blood. I had actually driven past him and the band in town earlier that day and –for a fraction of a second- had been tempted to roll down my car window and shout “Only losers take the bus!” Thankfully, I thought better of it. If a guy could deliberately whack himself on the head with a microphone, who knows what he might have done to an idiot fan pathetically trying to ingratiate himself by half-wittedly demonstrating his knowledge of an obscure band’s oeuvre? His solo work since the demise of the Mansions has been articulate, sophisticated and sprinkled with occasional gems, but contains way more shade than light and is, to my ears, somewhat thin on melody; the fact that beautiful melodies do occasionally break out makes one suspect that, in shying away from pop music, Coughlan is cutting off his nose to spite his face. In that sense, ‘Against Nature’ might be viewed as the template for a brilliantly off-kilter pop career that never quite happened.